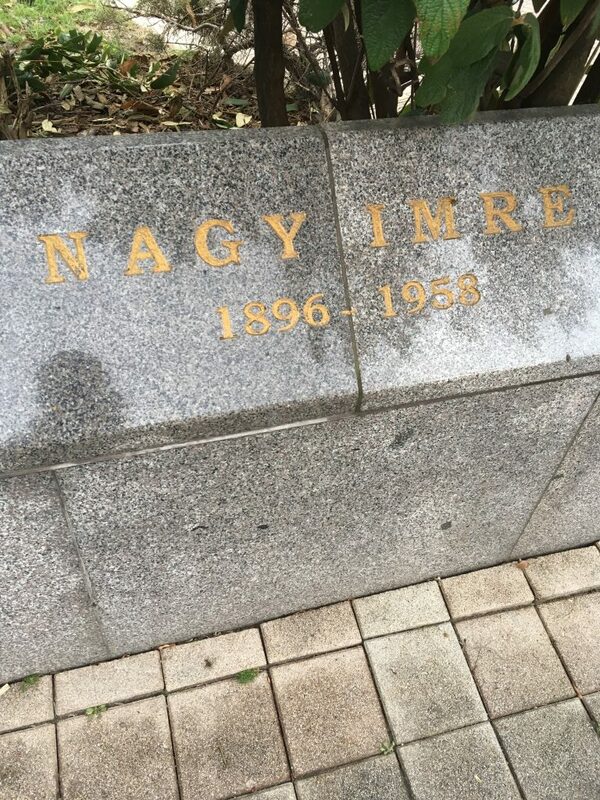 Imre Nagy is a hero of Hungary, prime minister twice, his second term during the tragic and failed revolution of 1956. Nagy was captured and tried by the Communists and executed in 1958. He was buried in an unmarked grave. Nagy’s name could not to be mentioned during the Kádár regime. At his reburial in 1989 a crowd of 200,000 gathered at Heroes’ Square to listen Viktor Orbán’s passionate speech. Nagy became a symbol of the new, free Hungary. His statue, facing the Parliament was installed next to Kossuth Square. We woke up today to a grey, foggy winter morning and heard the news that Nagy’s statue was removed overnight. My wife and I immediately went out to Kossuth tér; the statue was gone indeed. 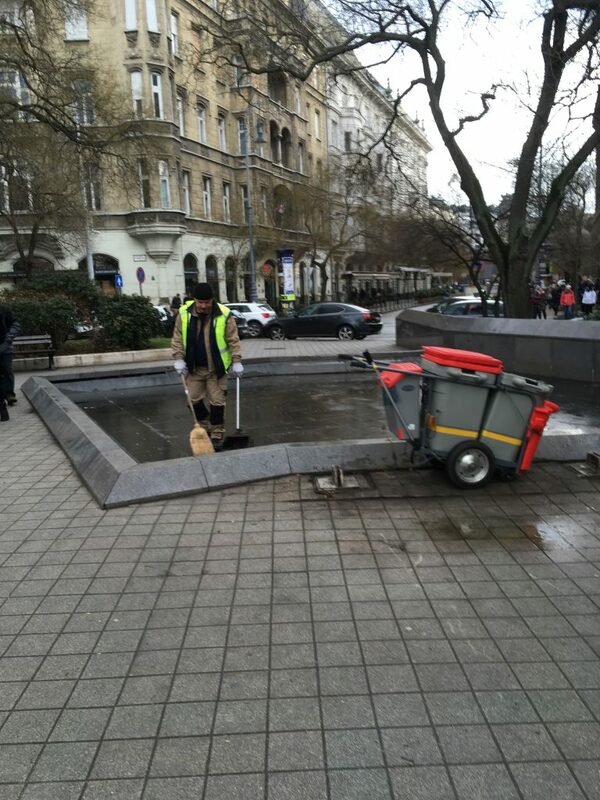 I asked the lonely city worker who was cleaning the pool where the statue had stood. He told me that it happened at 4:00AM. Did they use a big crane? – I ask. No, no – he explained – they cut it. Lifted the statue and cut the metal bridge into pieces. He shows the now empty metal bolt holes used to stabilize the structure. They did a professional job – I compliment. Yes – he said – it was done in an hour. Mihály (Michael) Károlyi’s and György (Georg) Lukács’s statues were also removed in predawn hours, and Roosevelt’s name was scratched from a major Budapest square. Now it is Imre Nagy’s turn. 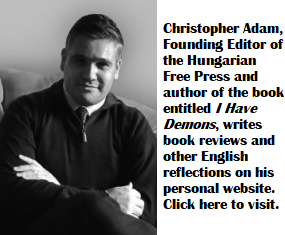 His anti-fascist and Communist past have became uncomfortable for the Orban regime. Step-by-step Hungary is turning into an openly fascist state. This is so grievous. Where was the statue and bridge taken? In America they have removed so many statues relating to the confederacy. I find that also very disturbing. Whoosh! The sound of a point being wilfully missed. Those statues were paid for and built as a direct affront to the civil rights movement. People love to whine about these ‘Historical’ statues being removed but actually, virtually all of them were built in the 60’s. None of them have any historical significance. The reason they’re being removed is because they were paid for by a private company (“Charity”) who’s only objective was to divide american people. Eliabeth, those are statues of racists who fought for racism. In no way is it comparable. How is the confederacy associating slavery and Jim Crow laws (segregating blacks from whites) analogous with Imre Nagy’s status in Hungarian history?? This is what leftists do. They remove statues of certain historical figures in an effort to remove culture and history itself. Leftists and leftist groups are terrorists that uphold and support the status quo. Fascism is right-wing, and you’re an idiot. Can you read? Do you understand what has been written in the article? Do you know what “leftists” are?…. Because it’s certainly not “leftists” who have removed this statue (and others), it is the extreme “rightist” government. Doh. Nem ismerjük a harc eszközeit, nem ismerjük a harc körülményeit, csak a harc eredményét ismerjük. A sátán számára nem maradt hely, mert Mihály, aki a szeretet, a szolgálat és a derű, nem hagyott neki. Mármint helyet. The Turul [ancient Hungarian/Nazi era bird] is an ancient image the ancient image of the Hungarians. We are all born into it as we born into our language and into our land. The ancient image is belong to our blood and to our land. Since we have emerged as the Hungarian people, our seven tribes have been bound by blood, our king St. Stephen set up a state, our armies were defeated at Mohacs. The Turul has remained the symbol of national identity to all Hungarians living today, to the dead hungarians and to the hungarians who just will born. “We are fighting an enemy that is different from us. nt, the point of the post is that it is a Right-wing government which is removing statues from Budapest, not “Leftist”. In case you hadn’t noticed, Fascism is not on the “left” of the political spectrum. Re-writing history, that’s how, just as the Hungarians have been doing it for well over a half century. It started in the US also. They even attacked a Jefferson statute as well. But do not forget, for the south it was their history. The civil war was bloody enough,no need to rub it in ! But why removing statutes even from cemeteries ? Now just why in this world one can not ask a simple question??? Who voted to have the statute removed ? Was it a city, county, or state property ??????? Even that must be a secret now-days ???? Somebody had to decide, or at least approve of it. Bendeguz: Google is your friend. Figure it out and stop trolling this page. This is why your comments are being deleted. Author of article could have opted to make friends with Google as well. Statue is being relocated. He only told half the story, which amounts to fake news. Moving it diminishes it. And it is not simply being moved, it will be replaced. Signaling that the message of the new statue is more important. The place it is being moved to out of the way and far less prominent. I know the spot. It is a place people pass through, not a place people visit. And totally lacks the historical context of the present location. There was not one falsehood in the piece. You are, as usual, a liar. It will keep the Columbo statue company…. Author is 100% guilty of it, because article leaves reader with impression that statue was simply removed, with no alternate plans for it, which is a lie. You are in fact contradicting author as well through your comment by referencing the fact that statue will be put back on public display. Well, I am glad Joe agreed with the rest of my comment. Or was that just an ommision? And if so, why did he omit it? Maybe his comment is just “fake news”. Lie dedetector Joe „… because article leaves reader with impression that statue was simply removed, with no alternate plans for it, which is a lie.“ … and if a liar writes there is a liar then you have to believe that. … and if he does not write what corresponds to your narcissistic idea, then he is a liar. I see the The Arrow Cross raising it’s ugly terrorist head again. I just learned that the Kossuth Square faces restoration. The Nagy statute will be placed at the Jaszai Mari Square before June. 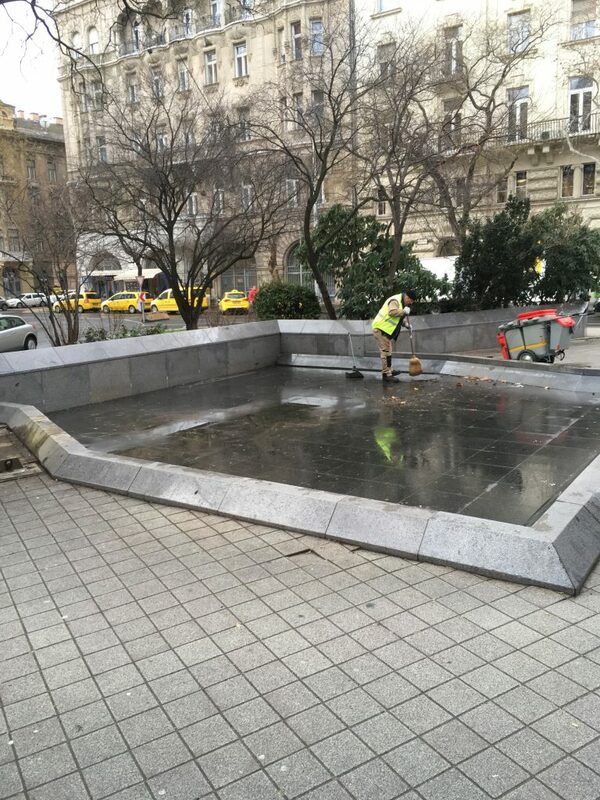 At the Kossuth Square the old memorial will be replaced, that the communist has removed. So there was more behind than just scrapping the old bronz. To the bullies, revisionists, fear-invoking tweeters and all those in power who use their might to distort truth – we do not accept alternate facts. Lies are just that – lies. The Hungarian Revolution of 1956 resulted in global change ~ deal with it. No people anywhere are born to be subjugated, no matter what ridiculous venom you spew ~ we know better, we will stand against you, you will fall. 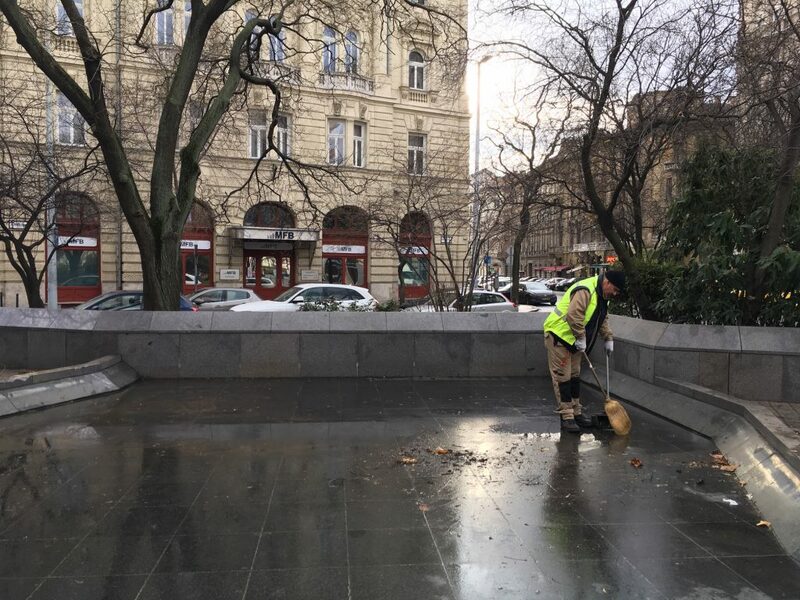 The removal of the Imre Nagy statue from its place near the Hungarian Parliament is part of Viktor Orbán’s personal quest to re-write his country’s history. He wants to glorify those who introduced Europe’s first anti-Semitic laws after WWI, who suffocated Hungarian democracy from the 1920s onward, and shipped half a million Hungarian Jews to the abattoirs of Auschwitz. He wants to destroy the evidence, that a lifelong Socialist, such as Imre Nagy, could have something to do with that glorious, heroic rebellion in 1956. He wants to ensure, that the next time his puppet master, the master of the Kremlin visits the Hungarian Parliament, he wont be embarrassed by the statue of a man, who dared to stand up to Russia. Three evil ideologies were born in the 20’th century. One you already mentioned and rightly condemned. The other, which Imre Nagy belonged to, you seem to try to whitewash, even though it is a historical fact that it produced at least twice as many victims than the one you were eager to condemn. Good news is that both of those ideologies are currently to be found in the dustbin of history. It is only some misguided (or opportunistic) people like yourself who insist on claiming that one of them, or the other is still with us. The third one is just as evil, but it is still with us though! You belong to it, even though I suspect you hardly realize it. It is by far the most sophisticated of the three, which is why it is still around, infecting much of the Western World. It uses the memory of the other two primitive ideologies as a way to divert attention from itself. Its victims will be not just individuals but entire nations. Western civilization itself is within just a few decades of extinction thanks to the deep penetration of this cult into general Western culture and all its institutions of control and means of persuasion. Kalergi was the father of your cult, I recommend you read into his ideas, so at least you understand what it is that you are following and advocating for. Don’t worry, for it will likely not dissuade you from continuing to follow and advocate for it. After all, the extinction of countless distinct native cultures, in favor of one world government, which will be governed by a new “enlightened” nobility, which will rule over a mass of “global citizens” with no particular ethnic, religious or racial identity to coalesce around, thus making them theoretically more docile, is just the kind of cult ideology that one such as yourself can get on board with. Bad news for the followers of this cult is that it will not catch on in the rest of the world. It will only serve to kill its current host culture. Once it does, it will die with us! Such a shame. This kind of action is taken for granted these days. Why are people acting as if numbed and brow-beaten. Raise up your head and look and listen for the silence. The silence of your future. I welcome your reference to the NYT piece. Ben Novak is right on the money. I make the following addendum to the citation, in honor of Franz Kafka (or Joseph Heller). For those who may not know, Mr. Kövér was a card carrying communist before the collapse of the Berlin wall. He was a Secretary of the Young Communist League, and had a full time job at Party Headquarters, working in an administrative position for the Part’s Central Committee. Kövér was happily climbing up the Communist Party’s career ladder, when Mr. Gorbachov upset his plan by introducing his Perestroika, and Glassnost, and thus, Kövér and his bunk-mate Viktor Orbán (who was also a Young Communist League Secretary on the up and up) lost their comparative advantage. They had to find themselves a new affinity fraud. First they used the language of liberalism. When that didn’t work its magic, they reached out for a the language that propelled the white supremacist Christian alt-right of Admiral Horthy to greatness. To make a long story short: Mr. Kövér and his boss constitute the ugly face of the new-Fascist Hungarian autocracy. They are adored by Putin, Steve Bannon, Richard Spenser, the boys in the Ku Klux Klan, Bolsonaro in Brazil, Erdogan in Turkey, and all the European Fascists who are misidentified as populists. I pass it back to the resident idiot-troll, Mr Bendy Goose. He can always be counted on to bring up the rear…. Absolutely correct, N.I. was a bloody handed communist, was not he ? Imre Nagy PM, Pàl Malèter Min. of Defence, general Bèla Kiraly, Géza Losonczy, Zoltán, Tildy, Bèla Kovács , etc, were the leading figures of the revolution, like it or not. All the Mària Schmids, Veritas Institutes, Pesti Sràcok articles, Angel Gabriel monuments, etc falsifications of history are silly attempts guaranteed to fail in the internet age, although Orbàn and Felcsutia still don’t grasp the impact of the ITtechnology. As Andràs Göllner pointed out the removal of the statue is only a part of the regime’s re-writing of history and its Kulturkampf to eliminate any and all ideas and cultural traditions it doesn’t like and to replace them with such notions and dictions it find useful. Why, it’s fascism folks and all such dictatorships do the same.